The University of California, Los Angeles (generally known as UCLA) is a public research university located in Los Angeles, California, United States. Established as a branch of the state university in 1919, it is the second-oldest general-purpose campus in the University of California system and has the largest enrollment of any university in the state. In March 1881, after heavy lobbying by Los Angeles residents, the California State Legislature authorized the creation of a southern branch of the California State Normal School (which later became San José State University) in downtown Los Angeles to train teachers for the growing population of Southern California. The State Normal School at Los Angeles opened on August 29, 1882, on what is now the site of the Central Library of the Los Angeles Public Library system. The new facility included an elementary school where teachers-in-training could practice their teaching technique on children. In 1887, the school became known as the Los Angeles State Normal School. In 1914, the school moved to a new campus on Vermont Avenue (now the site of Los Angeles City College) in Hollywood. In 1917, UC Regent Edward A. Dickson, the only regent representing the Southland at the time, and Ernest Carroll Moore, Director of the Normal School, began working together to lobby the State for the school to become the second University of California campus, after Berkeley. On May 23, 1919, their efforts were rewarded when Governor William D. Stephens signed Assembly Bill 626 into law, which turned the campus into the Southern Branch of the University of California and added its general undergraduate program, the College of Letters and Science.The Southern Branch campus opened on September 15 of that year, offering two-year undergraduate programs to 250 Letters and Science students and 1,250 students in the Teachers College, under Moore's continued direction. Enrollment at the Southern Branch expanded so rapidly that by the mid-1920s the institution was outgrowing the 25 acre Vermont Avenue location. The Regents conducted a search for a new location and announced their selection of the so-called "Beverly Site"—just west of Beverly Hills—on March 21, 1925. (The original Vermont campus is now home to Los Angeles City College.) After the athletic teams entered the Pacific Coast conference in 1926, the Southern Branch student council adopted the nickname "Bruins," a name offered by the student council at Berkeley.In 1927, the Regents renamed the school itself the "University of California at Los Angeles" (the word "at" was officially replaced by a comma in 1958, in line with other UC campuses) and the state broke ground in Westwood on land sold for $1 million, less than one-third its value, by real estate developers Edwin and Harold Janss, for whom the Janss Steps are named. The original four buildings were the College Library, Royce Hall, the Physics-Biology Building, and the Chemistry Building (now Powell Library, Royce Hall, the Humanities Building, and Haines Hall, respectively), arrayed around a quadrangular courtyard on the 400 acre (1.6 km²) campus. The first undergraduate classes on the new campus were held in 1929 with 5,500 students. In 1933, after further lobbying by alumni, faculty, administration and community leaders, UCLA was permitted to award the Master's degree, and in 1936, the doctorate, against resistance from Berkeley. "I picked up the telephone and called in from somewhere, and the phone operator said, 'University of California.' And I said, 'Is this Berkeley?' She said, 'No.' I said, 'Well, who have I gotten to?' 'UCLA.' I said, 'Why didn't you say UCLA?' 'Oh,' she said, 'we're instructed to say University of California.' So the next morning I went to the office and wrote a memo; I said, 'Will you please instruct the operators, as of noon today, when they answer the phone to say, "UCLA."' And they said, 'You know they won't like it at Berkeley.' And I said, 'Well, let's just see. There are a few things maybe we can do around here without getting their permission.'" 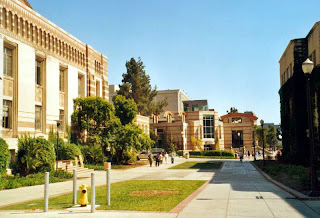 UCLA comprises the College of Letters and Science (the primary undergraduate college), as well as four other undergraduate colleges (Arts and Architecture, Herb Alpert School of Music, Henry Samueli School of Engineering and Applied Sciences, Nursing, and Theater, Film, and Television), seven professional schools, and five professional Health Science schools. Since 2001, UCLA has enrolled over 33,000 total students annually, and that number is steadily rising. 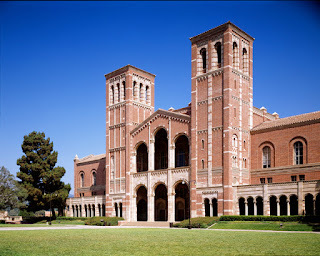 Students at both levels are enrolled in the UCLA School of the Arts and Architecture, the Henry Samueli School of Engineering and Applied Science, and the School of Theater, Film, and Television, while the Graduate School of Education and Information Studies, the Anderson School of Management, the School of Public Affairs, and the School of Law serve graduate students. The UCLA School of Medicine is widely renowned for its Medicine Program and Research. In 1981, the UCLA Medical Center made history when an assistant professor named Michael Gottlieb first diagnosed an unknown affliction later to be called AIDS. UCLA medical researchers also pioneered the use of PET scanning to study brain function. The signaling cascade of nitric oxide, one of the most important molecules in cardiopulmonary physiology was discovered in part by the medical school's Professor of Pharmacology Louis J. Ignarro. For this, he was awarded the 1998 Nobel Prize in Medicine or Physiology along with two other researchers - Robert F. Furchgott of the SUNY Health Science Center and Ferid Murad of the University of Texas Medical School at Houston. In the 2007 edition of U.S. News and World Report, UCLA Medical Center was ranked best in the West, as well as one of the top 3 hospitals in the United States alongside Mayo Clinic, Cleveland Clinic, Massachusetts General Hospital, and Johns Hopkins Hospital. In 15 of the 16 medical specialty areas examined, UCLA Medical Center ranked in the top 20. UCLA is ranked 25th among "America's Best Colleges 2008: National Universities" by U.S. News and World Report, tied for third (with University of Michigan) for best public universities in the United States, and placed 13th in the world in 2007 in ranking done by the Shanghai Jiao Tong University.UCLA also ranked 11th in the nation in terms of quality of scientific research leading towards a Nobel Prize. UCLA is a Public Ivy, and one of the 25 New Ivies, a list of universities ranked by Kaplan. UCLA has more applicants than any other university in the United States. Out of 50,732 applicants for Fall 2007, 11,860 (23.38%) were admitted. Students come to UCLA from all 50 states and more than 100 countries, though according to statistics from 2001-05, an average 92.6% of the entire student body originated from California. UCLA's athletic teams, the Bruins, have won 121 national championships, including 100 NCAA team championships as of 2007—first to have won 100 and still more than any other university. In 2006, the university completed Campaign UCLA, which collected over $3.05 billion and is currently the most successful fundraising campaign in the history of higher education. UCLA faculty (including emeriti) have a history of achieving academic honors and prestigious awards. Most prominently, 90 professors are members of the honor society, American Academy of Arts and Sciences, and 52 have been awarded Guggenheim Fellows grants since 1992. Six professors have been awarded the Nobel Prize (two of which are currently members of the faculty), and Jared Diamond, a professor of Geography, won a Pulitzer Prize for his book Guns, Germs, and Steel.. There are seven MacArthur Foundation Fellows on the faculty. Four alumni have also received Nobel Prizes for achievements in science and Peace; notably, Glenn T. Seaborg was awarded the Nobel Prize in Chemistry in 1951 for his discoveries about the transuranium elements. In 2006, 54 faculty members were listed as "Highly Cited" by the Institute for Scientific Information. A professor of mathematics, Terence Tao, was awarded the 2006 Fields Medal.